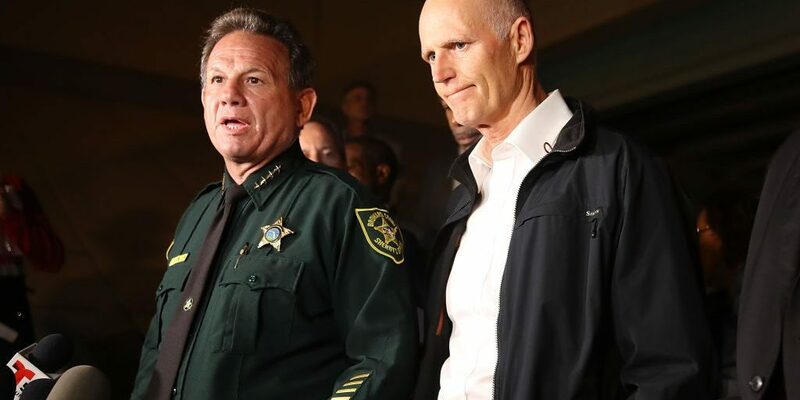 Florida Governor Ron DeSantis formally suspended Broward County, Fla. Sheriff Scott Israel on Jan. 11, following controversy over his department’s handling of the Marjory Stoneman Douglas High School shooting in February 2018 in Parkland, Fla.
DeSantis issued the executive order three days after assuming office, a news release indicates. Last April, DeSantis had said that he would have suspended Israel had he been governor, the Associated Press reports. Israel has been criticized in his department’s handling of the Stoneman Douglas High School shooting. A commission appointed by the state submitted a report to state lawmakers on Jan. 2 that detailed how eight sheriff’s deputies heard gunshots but stayed outside the building when they could have potentially saved lives, The New York Times reports. Moreover, the investigation found that police radios jammed on the day of the shooting, an issue that had occurred the previous years during a shooting at Fort Lauderdale, Fla.’s airport, according to the Times. It was also discovered that prior to the shooting, deputies hadn’t trained for responding to an active shooter for months. On Jan. 8, 2017, a mass shooting occurred at Fort Lauderdale-Hollywood International Airport. While Broward County sheriff’s deputies neutralized the shooter in 72 seconds, a draft of a county report found that Israel and other law enforcement officials left passengers huddled together in fear for hours, the AP reports. “These incidents demonstrate Sheriff’s Israel’s repeated incompetence and neglect of duty. The families of the victims deserve accountability,” DeSantis said in a news release. Israel assumed the mantle of Broward County sheriff in 2012 after a lengthy law enforcement career, the AP reports. He has said that he plans to fight the executive order in court. DeSantis has named former Coral Springs, Fla. Police Sergeant Gregory Tony as Israel’s replacement, a news release shows. Tony will serve as Broward County’s first African-American sheriff. “It is my intention to embark on this enormous task to restore the confidence of families and residents of Broward County toward the Broward Sherriff’s Office, which also requires that I fix the problems that exist,” Tony said in a news release.